8 Bedroom Detached House For Sale in Torpoint for Guide Price £800,000. Tor House is a beautiful and impressive detached Grade II listed property in the picturesque South Cornwall region. This stunning property set over four floors features a wealth of elegant and classical interiors dating from 1792. 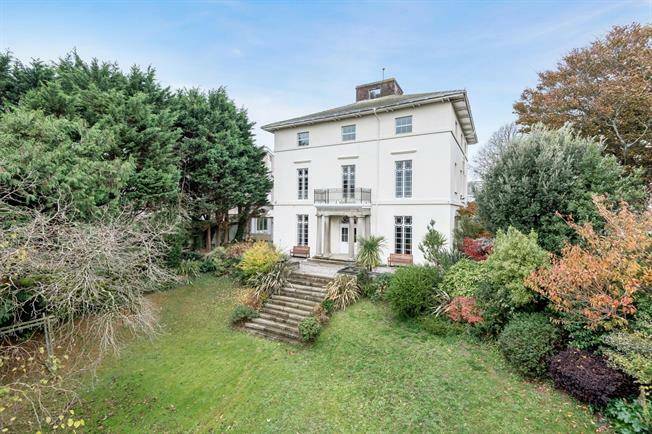 There are a number of elegant rooms to this property which include a magnificent ballroom, impressive dining room, large fitted kitchen, plus further living areas throughout the property. Arranged over the first and second floors are 8 large bedrooms some of which have en-suites shower or bathrooms. There is also a unique basement with original flagstone cold storage, wine cellar plus food preparation rooms. Externally there is large walled garden with trees and shrubs plus a parking area for 4 cars. At the rear of the property is the gated cobbled courtyard providing further parking and access to the garage and the detached cottage. This was the former coach house and stable for the house. Tor House offers the potential for a perfect wedding venue, Guest House, Commercial Office space or simply a truly stunning residential home. The property is located a stones throw away from Plymouth, nestled away on the Rame Peninsular of Cornwall, we are within easy reach of many 'must see' Cornish locations, including the many golden beaches and quaint harbours dotted along the coastline. Torpoint lies at the mouth of the river Tamar. The river can be crossed here by three chain ferries, which carry cars and pedestrians across the 500 yard wide tidal estuary. Torpoint is the Gateway of South East Cornwall and the Rame peninsula. The town has developed to provide a variety of housing, schools, shops and amenities, plus the many river activities such as sailing. Nearby there are many costal walks, parks and countryside to explore along with Antony House (now in the ownership of the National Trust) is the seat of the Carew-Pole family, whose forebears were responsible for much of the early development of the town in the eighteenth century. The Property has mains water, electricity and gas. There are 2 gas fired combination boilers providing hot water and zoned central heating. There is also a further hot water storage cylinder. The AGA is gas. The listing covers the main house with some specific features of the property detailed. The stone wall surrounding the property is also part of the listing. Detailed information is available on request.